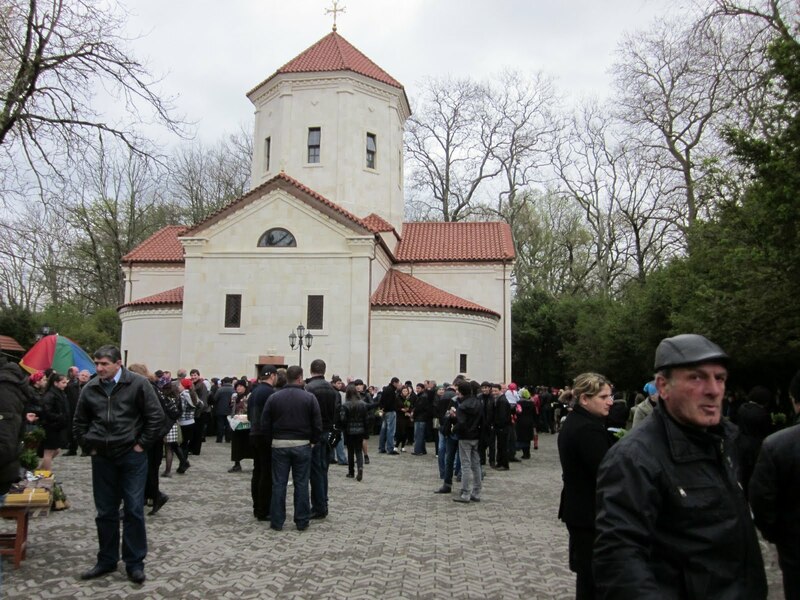 I first want to mention that I spent last weekend in Zugdidi with some other TLG volunteers. The volunteers in this city were hosting a Karaoke Night for the schools in Japan to help rebuild from the earthquakes. There were many volunteers that showed up. Together we raised over 300 GEL! We had some drinks around town and spent the night at a great new hostel. The owner, Regina, opened early for the event. She is a past TLG volunteer and amazing. The place was really nice even though they were still working on remodeling it. If you ever find yourself in Zugdidi, Georgia, stop there for a night. It’s well worth the reasonable amount of 20 GEL. It was a blast. I also spent some time walking aro und the Palace on Palm Sunday. The small church is next to the palace. Women were all over the gardens selling small baskets of palms. These aren’t the palms that we use in the states. Instead they use a small bush that grows faster for the day. The church was so crowed that people were waiting outside in large groups waiting to catch part of the services. I stayed home for our long break. Nino and Gocha’s kids came to Poti. Their two sons and the oldest’s wife are here until Monday. The house is filled with a gigantic amount of food. It doesn’t even fit in the fridge. 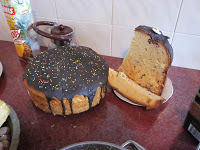 We have two regular cakes and five Pacas or Easter Cake (it’s essentially hot cross buns done in a cake form) It’s a good thing, too, since there seems to be some new friend or family member at every meal. Lots of people going in and out. Everyone is just talking and eating and enjoying each other’s company. It’s nice but awkward at the same time. I only understand half of the conversations. I also feel like I’m invading into something I shouldn’t be. Nino and Gocha don’t get to see their kids much anymore. I try to give them space to talk without worrying about entertaining me. It’s an interesting balance for managing my time spent with the family and alone. 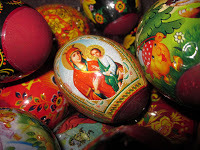 The really great tradition here that is similar to the states is dying eggs! They only use red dye to symbolize the blood of Christ being shed. My family then put plastic pictures around the eggs for added decoration. 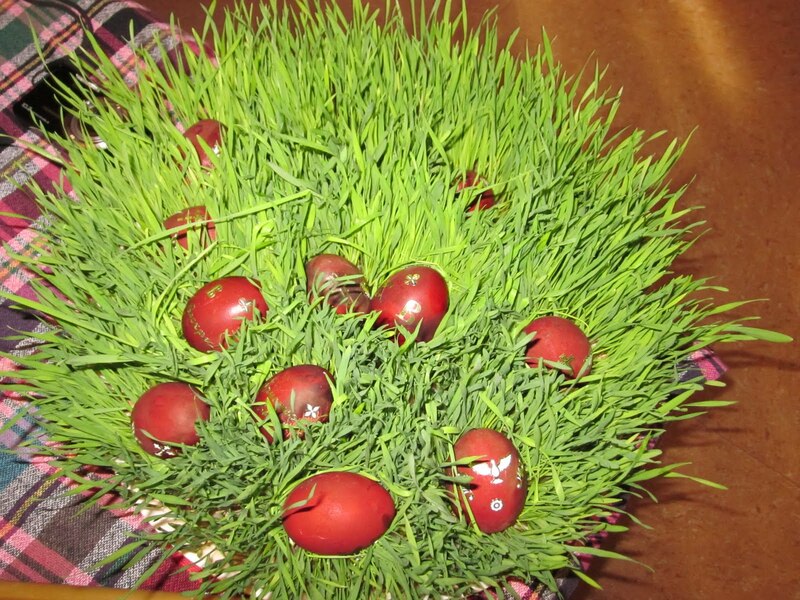 During lent many families have been growing wheatgrass for this weekend. They put the eggs in the grass or around it. It’s a nice reminder of the greenhouses at home. It’s an exciting weekend filled with people and food, a perfect way to celebrate spring and Christ rising. Happy Easter!